Hermoine came ashore last night at 1:30am as a Category 1 Hurricane. The wind howled all night up to 50 knots, but we moved very little. We had tied the boat securely about 1 metre off the floating docks and while we could feel tugging and a little bouncing, we never hit the dock, nor did we rock very much. Due to the noise, and yes, some worrying, there was someone up every few hours during the night to check on things. For the most part though, once asleep we slept through it all. Sail Quest has weathered the storm without any damage what-so-ever. Most of the other boats also got through unscathed, though not everyone. There was one boat in particular who suffered a fair amount of damage... more than all the other boats combined! 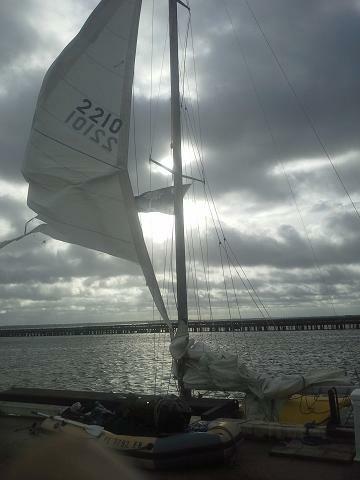 They have a damaged main sail, a totally shredded jib, and the roller furling has broken. I am certain that the roller furling and jib failures are related. I am not sure which came first, but the first failure most definitely lead to the second failure. That is the boat whose owner spent most of yesterday in the lounge watching TV while every other owner was out securing their boats. Just goes to show what happens when you do not prepare your boat. The sun is currently out and shining brightly. There is still a fair amount of wind... about 10-15 knots, gusting to 25, but it appears the worst has passed. Scattered rain showers are passing through, and will continue to do so for the rest of the day.